Walter Whitcomb Thompson (1882-1948) was a native of South Carolina. He studied at the University of Florida and at the New School of Design in Boston. 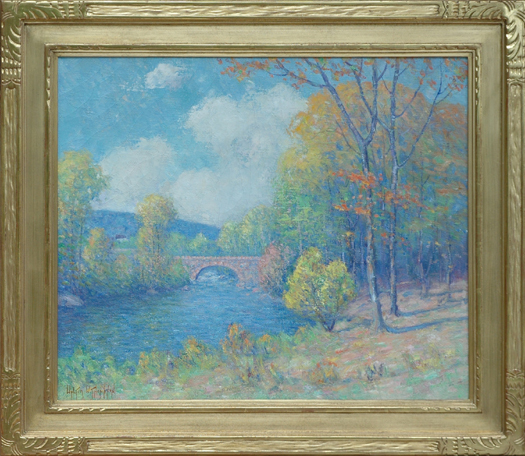 Thompson was a member of the American Artists Professional League, Carolina Art Association, Georgia Art Association, North Shore Art Association, Savannah, GA Arts Club, and Sumter, SC Art Association. He was a co-founder and director of the Beaufort, SC Art Colony, director of the Beaufort, SC Art School, as well as a teacher in the Beaufort, SC public school system. He exhibited at Coker College in Hartsville, SC, Gibbes Art Gallery, Charleston, SC, Mint Museum, Charlotte, NC, North Shore Art Association, Gloucester, MA, Telfair Academy of Art, Savannah, GA, Savannah Arts Club, as well as in prominent New York City galleries such as Ainslie, Milch, and Macbeth Galleries. Artist First Name Walter W.
Comments This painting is in excellent condition in a hand carved gold frame, also in excellent condition. Walter Whitcomb Thompson (1882-1948) was a native of South Carolina. He studied at the University of Florida and at the New School of Design in Boston. Thompson was a member of the American Artists Professional League, Carolina Art Association, Georgia Art Association, North Shore Art Association, Savannah, GA Arts Club, and Sumter, SC Art Association. He was a co-founder and director of the Beaufort, SC Art Colony, director of the Beaufort, SC Art School, as well as a teacher in the Beaufort, SC public school system. He exhibited at Coker College in Hartsville, SC, Gibbes Art Gallery, Charleston, SC, Mint Museum, Charlotte, NC, North Shore Art Association, Gloucester, MA, Telfair Academy of Art, Savannah, GA, Savannah Arts Club, as well as in prominent New York City galleries such as Ainslie, Milch, and Macbeth Galleries.